Unlike wine tastings, one of the greatest joys of sampling fine malt whisky is that the taster is under no obligation to spit it out. My golfing companion and I had embarked on a madcap tour of the best of Scottish golf courses and we also wanted to sample the best of Highland whisky on our travels, which brought us to Tain, home of Glenmorangie. The beauty of Glenmorangie, pronounced incidentally like “orangey” with the emphasis on the second syllable, is that not only can one enjoy a tour around the distillery and sample some of the world’s finest single malt, but one can also stay just five miles north in Glenmorangie House in one of the six sumptuous and individually furnished bedrooms, all of which come equipped with a decanter of delicious malt whisky. We had played up the road at Tain golf club during the afternoon and, having enjoyed a long hot bath, I sat gazing out to sea from my room, supping a heavy tumbler of whisky with just a small dash of water, as is the traditional way. I cannot recall when I was so entirely at peace with the world. Even the horrors of my short game during my round at Tain were put clean out of mind. Matheson shipped two old gin stills up from London to begin his process and built the rest of the plant around them before selling the business on to Macdonald & Muir, a wine and spirits business based in Leith—and Glenmorangie’s best customer. The Macdonald family was to retain ownership for almost 90 years, when the company was acquired by the French luxury goods conglomerate, Louis Vuitton Moet Hennessy (LVMH) in 2004. And whilst the ownership may have changed the tradition most certainly has not. Water is still drawn from the Tarlogie spring, barley still harvested from local fields, the distillation process is still undertaken by 16 local workers, who have long been known as “The Sixteen Men of Tain,” all of whom still undertake the majority of their tasks by hand. A tour around the distillery takes the visitor through the entire process from when the spring water is added to the barley that then germinates when enzymes turn the starch within the barley into soluble sugars that will later be converted into alcohol. The most impressive part of the tour, apart from the tasting at the end, is walking through the rows of giant copper wash stills, the tallest in Scotland, that hold the liquid that produces the vapors that cool in the necks of the coppers to condense back into alcohol. The stills must be made of copper as all other metals tried have failed to produce a top quality whisky. 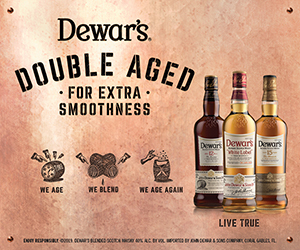 Having distilled the liquid, the production process has barely begun because it must then be left to mature in oak casks that provide two thirds of the whisky’s flavor. 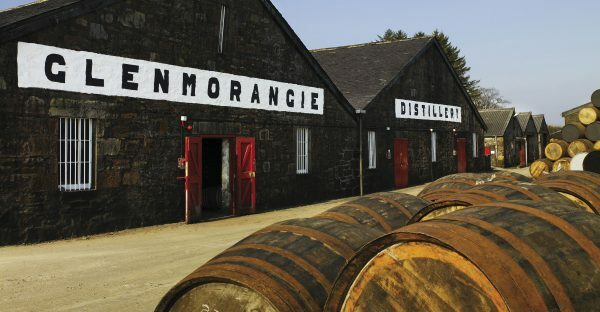 The bulk of Glenmorangie casks are imported from the USA where they have contained Bourbon or Tennessee whisky. The Original Glenmorangie single malt is aged for 10 years in Bourbon casks from Missouri that help develop a mature spirit that is soft, mellow and creamy to the palate. Since LVMH bought the company the Glenmorangie team have scoured the world for different casks capable of transmitting a variety of subtle flavors to bespoke whiskies that are transferred after the standard 10-year maturation. Sauternes casks have been imported from France to deliver rich, spicy and dessert-like flavors to the Glenmorangie Nectar D’Or, highly unusual with French casks that only rarely complement a single malt. The Glenmorangie Lasanta is aged for an additional two years in Oloroso casks from Spain while Quinta Ruben spends its last two years in Port casks from Portugal to deliver a scent that is akin to mandarin and Seville oranges. My golfing pal and I loved the 18 year old Glenmorangie, which spends 15 years maturing in American casks and then a third poured into Oloroso casks before being re-blended. It is like drinking a warming, heathery-flavored honey with just a hint of smokiness. My pal remarked that it was so smooth he regarded it as the perfect putting medicine and immediately bought a bottle to transfer to the hip flask that he keeps permanently in his golf bag.